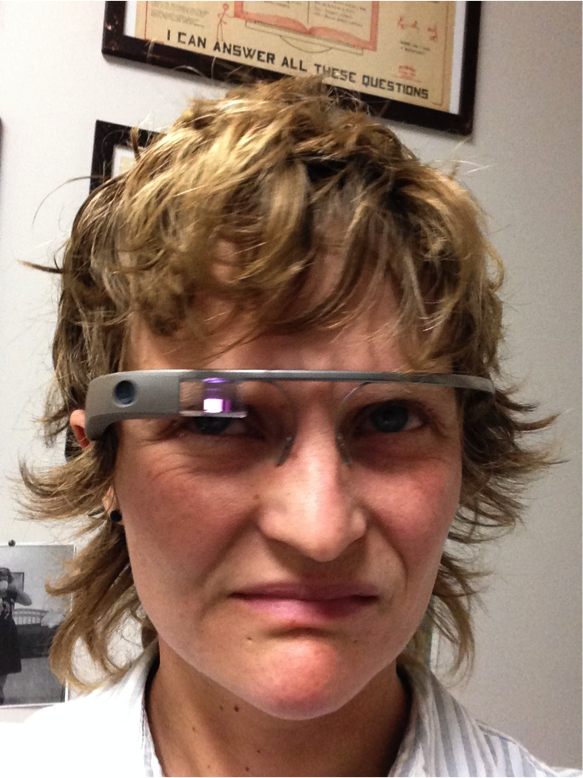 First confession: my library bought Google Glass about six months ago. Second confession: I have, shall we say, a conflicted relationship with Glass. Third confession: although my intrepid colleague and collaborator Dani Brecher and I just published a piece on the program we’ve developed at Claremont, I have strenuously avoided writing about it in this more personal venue. Fourth confession (more like revelation): our user community is seriously into the technology. This post is my attempt to reconcile these confessions. Google Glass has gotten a ton of press spanning from rhapsodic to horrified to hilarious, so I won’t rehash beyond a few basics: it’s a wearable smart device that sits on your face and projects a tiny screen slightly above the horizon-line of your right eye. It’s controlled by voice, touch, and gesture, and desperately requires a data connection to function properly due to the extent that it relies upon the cloud. Its inherent memory capacity is limited (12 GB), and its core uses are documentation (photo/video/audio), navigation, communication, and modest augmentation of reality. This infographic sums it up well. My subjective reaction to Glass when it was released was similar to what I experience with most proto-technologies: interest in implications and functionality mixed with skeptical vexation about various design and implementation factors. In this case, the latter was directed toward Glass’ corrective vision incompatibility (since addressed with the release of prescription-ready frames), cost (circa $1600 retail and perhaps a tenth that much to make), the limited scope of its availability (not to the hoi polloi until just yesterday), and the disconcerting sociocultural, physiological, and privacy connotations of face-bound wearable technology (legion). Wrap this up with the inevitable mental projection to the time in which we will all look back on this particular model as though it was an Atari 64 (relatively soon), I did not feel the slightest bit of desire to own a pair of Glass. Despite these compunctions, I also recognized the practical affordances of a device that allows for hands-free and connected visual engagement with experience – from the perspective of an educator, applications in teaching, learning, coaching, tutoring, exploring, and reflective practice are most interesting. Needless to say, I found myself pulled in several directions late in 2013 when I received an Explorer invite from a librarian who had created a Glass program at the University of Colorado at Boulder Libraries, which has provided much of the inspiration for our own. Because of my complicated feelings toward the device and memories of ill-fated technology programs past, I chewed on a strong sense of distaste at joining the hordes that either covet or flaunt Glass. While I certainly didn’t want Glass for myself, I had to consider whether my organization could figure out a way to make it useful and used. Pressured by a two-week window in which to make the purchase (a brilliant hard sell technique), after some lightning processing and community polling Dani and I proposed a Glass lending and demo program. We were met with an organizational mixture of enthusiastic support and (mostly) reasonable resistance focused on cost and dubious local use cases, including the most thorough mansplanation I have ever received on the intricacies of the hype cycle-nee-curve, which, of course, I had never heard of. not so much, but maybe a bit more. Our Glass program is simple. We had about two months of hands-on demo/discussion workshops followed by short loans to IT departments around the Colleges and in-class uses by faculty, and have now opened Glass to 5-day lending to students, staff, and faculty via an online application form. There have been a couple of awesome stories in student (1 and 2 in particular!) and also campus venues, and so much demand has resulted that we justified buying a second unit on Google’s recent limited Glass public release day. The C&RL News article has more details on program specifics, if you’re interested. 1 The physical experience of this design is unpleasant for me, as in uncomfortable. Plus, I see a pronounced retinal afterimage of the screen and my eyes feel pulled a little crossways after I take it off. 2 I don’t love the various control methods, as in talking to myself, whapping/stroking at my face, and whiplashing my head up and down – additional ocular and voice control would be more graceful and far less embarrassing. As opposed to gesture control, which, as demonstrated in this app developer’s video (which is most definitely not a parody), could lead to forceful interventions. 3 I wish it did more. From the perspective of people developing apps for Glass and those making it useful in their own contexts I can see tantalizing potential radness, but it’s still limited for the majority. 4 Glass doesn’t let you log into dual-authentication wireless networks, as in the things most campuses have. Duly reported. 5 Battery life barely lasts through a hands-on workshop, and Glass gets very hot when heavily used. 6 When I started testing Glass, unbeknownst to me it began uploading all of the random pictures and videos I was (accidentally) taking to my Google+ account, which had very open (default) privacy settings enabled. I don’t really use Google+, which meant that this unknown Glass activity led to hilarity and embarrassment (thanks for the heads-up, Jenny). You intensely sign in to all things Google when you wear Glass, and there’s no avoiding it unless you closely manage settings and/or apply obvious workarounds (as in, creating a ‘mothership’ Google identity for an institution or another Google ID). Of course, you should douse these opinions with plenty of salt: our campus users tend to be most enthusiastic, even when they pan Glass’ lack of current utility and social awkwardness. Loan applications have been super interesting and varied – for example, Tracy Seipser of CGU went on an epic Glass testing adventure, complete with a documentary of her woodwind group and guided gallery tours – take a look at the Prezi she developed to chronicle her process. I have a bit of a history with developing tech-based programs that end up crashing and burning, which is fine by me in the end: one learns a great deal from sifting through the wreckage. When you accumulate experience with emerging tools, a layer of scar tissue (otherwise known as ‘character’) cannot help but build, making one cautious about the equation wherein Library X immediately buys/develops/subscribes to Shiny Gadget Y and attempts to reactively justify the decision rather than apply it to the greater good. With this caveat in mind I truly believe that fortune can favor the brave, especially when the brave are mindful of their impact on others. Despite initial concerns that we might have purchased an expensive nose-weight, user reception has totally allayed those fears. Interest in our community is clearly based on a powerful confluence of scarcity and curiosity. Our workshops have been packed and highly engaged, and have worked well with a respective good-cop/bad-cop dynamic between Dani and myself that has allowed for an honest critical exploration of Glass’ (dys)functionality. Practical ideas for use in an academic context have flourished through user applications and discussions – everything from a reflective teaching tool (capture your teaching experience and review later, or ask a student to do the same) to reducing documentary discomfort that consenting subjects (particularly children) in educational, psychological, anthropological, and sociological research scenarios feel when they are aware of being filmed. And on and on. The lending and discourse aspects are key here – instead of reserving the tool for our own explorations, we’re attempting to make access to and discussions about Glass meaningful beyond a fad sense. What is clear is that in a limited access or high expense scenario, creating a program that engages both the critical and applied nature of a tool like Glass has the potential to be successful. Glassholeism is a thing, and I personally don’t want to go there. I have friends battling the creeping gentrification effects of Silicon Valley on communities losing the purchasing power to pay their rent, let alone walk around carrying on a public/private conversation with a tool of dubious current practicality. And I very much support them. That said, providing access to a technology is not the same as advocating for it (an important lesson for alpha cynics like myself to remember, particularly in a library context). I don’t personally support everything we offer on our physical and digital shelves, so why should I expect to feel the same way about the tools we provide to our community? Through our inherent ingenuity, humans translate the objects in their environments to nefarious and glorious ends. And the interpretation of those ends is entirely dependent on another human capacity: perspective. To fulfill their missions, libraries inevitably give their money to questionable sources depending on your particular POV. Like many other expensive things in this world, Glass is limited to a very, very few. As I see it, when libraries purchase and distribute Glass we’re helping make access more egalitarian, which is what libraries are all about. And most importantly, we’re trying to making sure the libary is reflecting its core responsibility as a consumer and purveyor of technology: enabling others to access and understand what they might not otherwise, whether due to cost factors or the fine line of interest that, when uninformed by direct engagement, usually tips toward -dis. When we ask classes and workshop participants, “is Glass worth it?”, we get a resounding chorus of “not yet, not for that much” – a few have said they’d buy Glass it for about the same price as an iPad, about a third of what it now goes for. But when we ask, “are you glad we bought it?”, there is an equally resounding chorus of “totally.” Without exception, people have been appreciative of the opportunity to, for lack of a less puntastic phrase, see Glass for themselves. I don’t love Glass, but I get it. Many in the profession are doing amazing things with Glass, and I stand behind our and other libraries’ plans for helping people explore emerging tools in the way we have for millennia with more conventional materials: by offering the fairest and most clear-eyed access possible and leaving the interpretation to the user. Interest in Glass will inevitably wane and our version of the technology will obsolesce, leading to a reevaluation of the utility of the program in its current form. But that’s the nature of the curve. Unit? Device? Pair? Contraption? For the sake of avoiding repetition, I will use the first three interchangeably. Endless gratitude to Dani Brecher and Lia Friedman, who helped kick this post into shape: I’m picking out a Thermos for each of you.